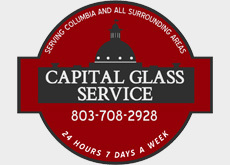 Here at Capital Glass Service we offer a wide range of products and services to fill your residential glass needs!!!! We offer competitive prices on our residential glass. From that rock straight out of the lawn mower to a failed window seal we can fix it!! Mirrors are a great investment for any space. They have the ability to make any area seem larger. Table tops are the best way to protect the top of your furniture and adds an elegant look. We can accommodate any pattern and thickness you want. Please use the guide to the right to pick the edge you would like on your custom table top.